Hess Oil Trucks are a Christmas season tradition in the Eastern and Mid-Atlantic regions of the United States. Every year since 1964 the fuel company has issued a commemorative truck, usually with electronic lights and sounds and always with batteries included. Last year they marked their fiftieth anniversary with an oversized replica of the original Hess Truck, and in addition they produced a really cool truck that carried a Space Shuttle, which carried a satellite, as their 2014 entry in the line. The first Hess Truck, in 1964, originally sold for $1.29. Even with the Hess name being phased out following the chain being sold to Marathon last year, the Holiday Truck line will continue. 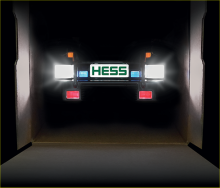 Hess Corporation just announced that the 2015 Toy Truck will be revealed in late October and sales will begin online November 1 at www.hesstoytruck.com with free standard shipping and five Energizer batteries included.This year’s truck is still a mystery, but the five batteries is a hint that it’s going to be something really elaborate and cool. Something else really cool is that for the first time, 100 lucky fans will unwrap a surprise this holiday season – a Silver Edition 2015 Hess Toy Truck, which will be randomly awarded in place of the 2015 Hess Toy Truck. This will be a Willy Wonka-Golden Ticket-style surprise that will make collectors go mad. To stay up to date with the Hess Toy Truck and to learn more about the 100 Silver Edition collectibles, sign up for alerts at www.hesstoytruck.com and follow Hess Toy Truck on Facebook, Twitter, @HessToyTruck, and Instagram, @HessToyTruck. If you don’t want to do all that, check back for the annual PopCult Gift Guide which will run for fourteen days starting November 1.I’m pretty sure the Hess Truck will be among my recommendations.